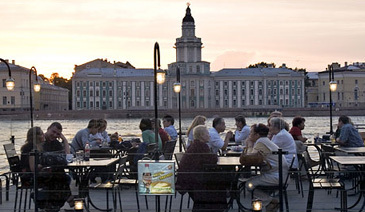 Dining on a floating restaurant on the Neva. JUST inside the entrance of the elegant Literary Cafe on St. Petersburg's Nevsky Prospekt, Aleksander Pushkin sits alone at a table by the window. Upstairs in the dining room, china tea cups clink and a Mozart sonata purls, but Pushkin is not listening. Dressed to the nines and staring fixedly into space, the poet - at least his wax effigy - broods upon love's bitter mystery and the sweet closure of revenge. As every Russian old enough to read well knows, this artful mannequin, complete with luxuriant black curls and full romantic sideburns, has been propped up by a window on roaring Nevsky next door to the KFC because the cafe was the site of Pushkin's last meal before his fatal duel in 1837. Buttonhole one of the cake nibblers and you'll hear the whole story: how Pushkin challenged the dashing guardsman Georges d'Anthès for brazenly wooing his ravishing wife, Natalya; how the insolent Frenchman fired first, tearing a hole in the poet's abdomen; how the wounded literary hero lingered for two excruciating days before he died, at the age of 38. You may even get a sonnet or a few lines of the novel-in-verse "Eugene Onegin," Pushkin's masterpiece, recited with eyes uplifted and breast swelling with pride. To an American, the Russian cult of Pushkin is a little mystifying. Even though I had journeyed to St. Petersburg expressly to pay homage to places made sacred in Pushkin - from the shadowy linden walks of the Summer Garden, where the youthful Eugene Onegin strolled with his French tutor, to the Marble Palace ballroom where the bored lady-killer danced the mazurka with the cream of St. Petersburg society - I was nonetheless stunned by the scope and fervency of Russia's Pushkin cult. Tolstoy, Dostoyevsky, Chekhov - all far better known and more widely read stateside - are commemorated in their native land with the occasional tour or plaque, but Pushkin is everywhere, especially in the former capital. His image greets you in grand public squares, museums, and street corner posters. Through revolution and all manner of siege, the poet's apartment, his school dorm room - even the patch of ground where the bullet felled him - have all been lovingly preserved. This most unlikely hero - an impoverished nobleman descended through his mother from an African slave, an artist who fused Mozart's grace and Byron's ironic smolder, a political rebel addicted to carousing and dueling - has been a superstar ever since his first poems appeared. Supposedly, on the day of his funeral, mourners from all over the city jumped in cabs shouting "To Pushkin!" and drivers whisked them to the church where he lay in state - such was the poet's fame. In Russia, he's Shakespeare, Thomas Jefferson and Bob Dylan rolled into one. "In Russian literature, Moscow is a calm city - but St. Petersburg is the place where all the bad things happen," Frank J. Miller, professor of Slavic languages at Columbia University, told me. "Pushkin started this theme of St. Petersburg madness with his story 'The Queen of Spades.' " Hermann, the cold-blooded hero of that tale, loses his mind over an obsession with a surefire gambling secret, but nearly all denizens of Pushkin's mad capital devote themselves night and day to trysting, drinking, dueling, party- and theater-going, and debt-incurring. "One can be capable and moral with manicure upon one's mind," insists Pushkin in "Eugene Onegin," whose hero requires the better part of five stanzas "to put his evening costume on." A swell, as the expression was. The goddess joins a masquerade. The splendid mansion stands aglow. One evening, though, in the lingering twilight of the northern summer, I did manage to track Pushkin's party-sated hero to the "granite shelf" of the Neva Embankment, where "lost in meditation" he listened to the sound of horses' hooves pounding the pavement of Millionnaya - the street of millionaires' mansions that runs from the Hermitage to the Field of Mars (a military parade ground turned public garden). I leaned over the same granite shelf in a fine rain that dimpled the river - as wide here as the Hudson and lined on both shores with the long, low facades of imperial masterpieces. As if on cue, a horse clopped down Millionnaya just as I ducked through the arch of the impossibly beautiful Winter Canal, which runs in a masonry canyon between the wing of the Hermitage known as the Large Hermitage and the Hermitage Theater. As darkness fell at last, I ended my stroll beneath the massive equestrian statue of Peter the Great that Pushkin christened the Bronze Horseman in his great narrative poem. "The Bronze Horseman" opens triumphantly with a paean to the window Peter cut through on Europe - "I love thee, city of Peter's making;/I love thy harmonies austere" - but it ends in despondency and madness. Crazed by grief after his beloved dies in the great Neva flood of Nov. 7, 1824, the hero imagines the "awful Emperor" spurring his horse off the wavelike granite pedestal and thundering after him through the city streets. In the glare of floodlights and the heavy night scent of flowers, there was indeed something nightmarish about this rearing pile of 18th-century bronze and stone. "Town so gorgeous, town of beggars," Pushkin wrote of St. Petersburg in one of his haunting lines, "Air of slavery, splendid face,/Pale green archway of your heaven,/Boredom, cold, and granite grace." Everything he loved and hated about the city - beauty and absolutism, magnificence and monotony, grace and ice - stares from the chubby, imperious face of the czar, three times life size. The Pushkin apartment museum on the Moika Embankment, a five-minute walk from the Winter Palace, is the most sacred shrine on the Pushkin circuit. After the dazzling immensity of Palace Square, the cityscape along the Moika feels intimate, melancholy - the scale of Amsterdam, the tarnished gleam of Venice, all of it washed by Petersburg's watery northern light. It was typical of Pushkin to choose to live in the most picturesque bend of the city's most beautiful waterway, but to the literary pilgrim the exquisite atmosphere is poisoned by the misery of his final days. For so worldly and cynical a man (he once referred to his wife as "my 113th love"), Pushkin could be violently sensitive to slaps. When he received an anonymous letter on Nov. 4, 1836, initiating him into "the most serene order of cuckolds" on account of his wife's public flirtation with d'Anthès, he went mad with jealousy. At the entry to the apartment museum, adjoining rooms display Natalya's tiny carnation-pink dance slippers and Pushkin's dueling pistols nested like Christmas ornaments in a velvet-lined box - the whole sad story of the poet's demise in a kind of visual haiku. The suite of rooms facing the Moika is as stately and graceful as any literary aristocratic could desire - lofty ceilings and windows, carpets of red and gold, gilded lamps, ruby decanters - but to me the artist came most alive in the room where he worked and died. Some 4,000 books cover the walls of Pushkin's study with the rippling brown and gold of stamped leather; his precious cane and Turkish saber are close at hand; a soft light from the three courtyard windows falls on the papers, books and trinkets left on the huge worn desk. Deep in the shadows beneath the bookshelves stands the heavy walnut-sided sofa where the poet bled to death while dreaming that he was climbing up the books. The country and city code for St. Petersburg is (7-812). Pushkin Apartment Museum, 12 Moika Embankment, telephone 571-3531, is closed Tuesday and the last Friday of each month; $7, at 29 rubles to the dollar, covers entry and English audio guide (tours are in Russian only). The Bronze Horseman monument stands in Decembrist Square overlooking the Neva just south of the Admiralty. 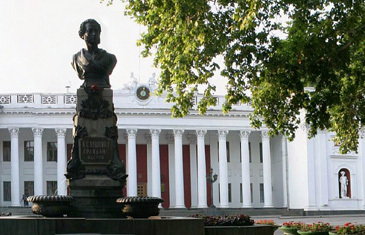 Another essential Pushkin site is the Lyceum, 476-6411, that he attended in Tsarskoe Selo, the imperial vacation village about 15 miles south of St. Petersburg. Closed Tuesday; admission $7. You can also tour the extensive gardens of the Catherine Park, which Pushkin wrote about, and the ornate Catherine Palace ($3.50 admission charged in summer only; there is an additional $17 charge to tour the palace; closed Tuesday and the last Friday of the month). Three blocks from the palace complex is the charming Pushkin Dacha, a rambling town cottage built for the valet of Nicholas I; Pushkin spent four months there after his marriage. Period furniture, family portraits and, in the upstairs study, the sofa on which Pushkin reclined while writing the final lines of "Eugene Onegin." Admission is $1.70. The Literary Cafe, Nevsky Prospekt 18, 312-6057, serves respectable if unremarkable soups, mayonnaisey salads, meat dishes and sticky desserts at reasonable prices (lunch runs about $40 for two people without wine). The Pushka Inn Restaurant and Bar, 14 Moika Embankment, 312-0913, next door to the apartment museum, offers interesting dishes like duck with baked apple and whortleberry sauce and mushrooms with fried potatoes. English menu available. Dinner for two without wine runs about $40. Kavkaz Bar, Karavannaya Ulitsa 18, 312-1665, a short walk from the Pushkin monument in Arts Square, serves Georgian specialties like stuffed grape leaves, kebabs and meat-and-potato hot pots in a cozy courtyard setting. Dinner for two without wine is about $60. Astoria Hotel, Bolshaya Morskaya Ulitsa 39, 313-5757, www.astoria.spb.ru, though built after Pushkin's time, has a well-worn aristocratic elegance the poet would have appreciated. The Bronze Horseman is a block west. Try to get a room facing St. Isaac's Square, since courtyard rooms can be dark. Doubles run from $390 for a courtyard room to $490 for a large room with a view. Kempinski Hotel Moika 22, 335-9111, just opened on the Moika Embankment 22, www.kempinski.com, has a terrific location between the Pushkin Apartment and Palace Square facing the Hermitage. Doubles from $387.